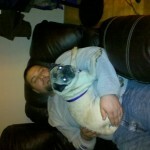 Gets along well with our 2 other pugs. Walking in flooring other than carpet. She has troubles getting her footing on the deck and our laminate floors when trying to run/trot or walk fast. She still shakes and cowers when someone approaches her and takes off when she hears a loud noise, but I’m assuming that both of those will be getter over time and she adjusts to being a dog and not just a baby-maker. Jessie is doing VERY well on her potty training; but you have to take her straight outside when she wakes up in the morning and right after dinner. 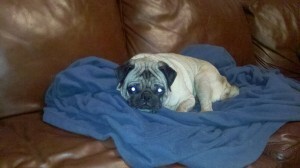 Other than that, she goes outside every couple of hours or so with our other pugs. We are trying to teach her to go to the door when she needs to go, but we’ve got quit a ways to go yet. But she has made WONDERFUL progress!!! She’s also learned that she gets a treat when she potties outside and if you forget to give her one, she lets you know! Jessie is also doing better about being in her kennel (she’s only in her kennel when my husband has to run errands and I’m at work). She still screams, but she calms down after a bit. We have also learned that she needs to go outside before being put in her kennel to prevent accidents. She still has accidents in her kennel every once in a while, but it’s much better than when we first got her. Jessie no longer seeks refuge under our deck. We can let her in the back yard without her leash. She runs around the backyard, plays with our other pugs and does her business. Jessie is also becoming more trusting and takes food out of our hands. Jessie still struggles with going down stairs. She acts like she wants to do it, but is scared so we are still working on that. Jessie is getting along great with Einstein and the Kitties. I don’t think Jess even realizes they are cats or that she is by nature suppose to chase them. Two nights ago she was sleeping on the Cozy Sac right between our two big male cats. Jessie is really coming out of her shell. She jumps around and plays now, and is starting to “talk pug” when she gets really excited. Our biggest challenge remains stairs. She has mastered our outside deck and cement stairs, but will have nothing to do with our wooden inside staircase. Hopefully with time she’ll figure them out.